Tis the season...for great theatre. Tickets make a great clutter buster gift idea. And shows keep visiting relatives entertained and conversation entertaining. We'll have full reviews up soon, but we're running out the door for yet another show. So, for the moment, here's our short list of the best productions currently playing. 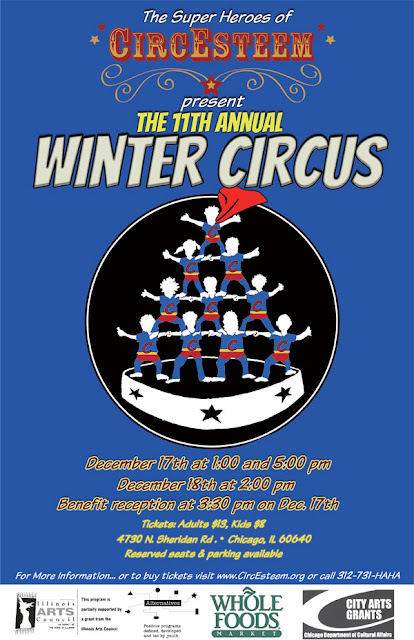 CircEsteem Winter Circus--2 days only-this Saturday and Sunday-Check out our prior coverage and show details here. A Christmas Story The Musical at Chicago Theatre--We caught opening night and the show was fantastic and exceeded our expectations. The kids had such fun with the production I want to return with MY parents, too! Check out our past coverage, including sneak peek rehearsal footage of some of the best song/dance numbers in the production! Click here for our original interview with the director, Tony Award winner, John Rando & The Major Award Song. Burning Bluebeard at TMLMTBGB (Neo-Futurarium)--Highly recommended! We caught this sold out show Thursday night and were completely blown away. We'll have a full review up tomorrow. Advanced tickets strongly encouraged. Here's a bit of our prior coverage. This dark comedy was a multilayered gift where the best intentions go horribly awry and a proudly, loudly proclaimed fireproof theatre erupts in flames. The 1903 Iroquois Theatre fire still stands as the worst single building fire disaster in history. My kids (8 & 10) were enthralled, especially since their circus clowning teacher played Bluebeard, and his real life wife played his wife. The kids were familiar with her work in 500 Clown-Trapped. As always, if your kids are sensitive or you prefer not to expose them to intense subject matter, then parents are cautioned to see it first or at least read up on the production in advance, before you make the call on bringing the littles. Kids are welcome, but the theme is intense, and more appropriate for tweens and up. The disaster is tastefully handled, with lots of humor, physical comedy and poetic revery. And we loved the juxtaposition of the past with nods to current disasters like the haunting version of Nirvana's "Smells Like Teen Spirit" that opens the show and the quirky lip sinc to Amy Winehouse's Rehab song. The Nutcracker-House Theatre Highly recommended alternative-dark-non ballet version. Check out our show review and past coverage here. The Nutcracker-Joffrey Ballet Highly recommended, elaborate, traditional ballet version, with an updated flair. #1 Nutcracker in the Nation. Check out our interview with Chicago area kids in the cast and our dress rehearsal footage.